Beautiful 18 karat gold plated Seed of Life Sacred Geometry symbol. Size: 2.84 inches in diameter by .02 inches (same thickness as a credit card). The Seed of Life is at the heart of the Flower of Life. It is believed by some to symbolize the seven days of creation. Seeds are magic, potent vessels of nature. They hold entire intelligent blueprints for life. They can lie dormant for ages before the conditions are ripe for them to burst into life. As a beautiful metaphor for consciousness, a seed represents the divine design within all things. It also is an expression of life force emanating from one cell into many in an intelligent manner. The “Seed of Life” is a contemporary name for an ancient geometric figure. 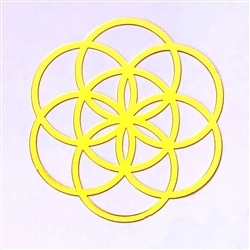 It consists of seven overlapping circles with the same diameter. Six of them are regularly spaced within the seventh, producing a rosette with eighteen lens shaped petals: six smaller ones inside and twelve larger ones outside.